Limbourg (Limburg in Dutch and German, Limbôr in Walloon ; pop. 5,700) is a small town on the Vesdre River. It was the capital of the Duchy of Limburg, which gave its name to the present-day Belgian province of Limburg and Dutch province of Limburg. The Duchy of Limburg developed as a state of the Holy Roman Empire. 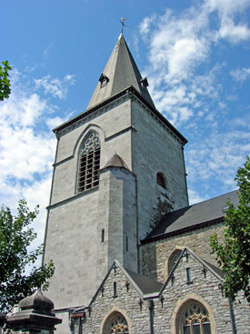 It was located at the very heart of the former Carolingian Empire, locked in between the cities of Liège, cradle of the Carolingian dynasty, and Aachen, capital of Charlemagne. Interestingly, the area coincides with the linguistic border between Dutch (Limburgish dialect), German (Ripuarian dialect) and French languages. The duchy was thus a unique trilingual entity, in spite of its diminutive size. The first castle on top of the massive rock above the Vesdre was constructed by Waleran, Duke of Limburg, in 1033. It possessed five big round towers. Impregnable fortress, Limbourg resisted a one-month siege by the troops of Emperor Henry IV in 1101. Upon the death of the last Duke of Limburg in 1288, a war of succession opposed the Archbishop of Cologne to the Duke of Brabant. The latter won, uniting the Duchy of Brabant with that of Limburg. Later, both titles would be inherited by the Dukes of Burgundy, then the House of Habsburg. Destroyed by a fire in 1504, the castle was reconstructed between 1519 and 1530, and adapted to the technological advances in artillery. Limbourg was besieged many times between the 16th and 18th centuries, notably in 1578 by the Spaniards, in 1632 by the Dutch, in 1635 by the Spaniards again, in 1675 by Louis XIV (who razed most of the town), in 1703 by the Anglo-Dutch under the command of the Duke of Marlborough, and in 1715 by the Austrians. Six sieges in 150 years by armies of five major European powers; it may be a record for a city that is really just a big village! The castle left in ruins by all these sieges, was completely dismantled in 1781. Julien d'Andrimont acquires the ruins in the late 19th century and erects a romantic castle, destroyed by the Germans in 1914. After WWI, the site is purchased by architect Jean Lejaer, then by Baron Jean Poswick, who built the residential castle that stands today. Limbourg is divided in two parts : the upper town on a rock above the Vesdre, which is the medieval town, and the modern lower town. Tourists usually confine themselves to the upper town. Sections of the ramparts still stand today, although not as high as they once were. Within the ramparts, the old town is organised around the main square and a tight network of small streets. Houses are made of grey stone, brick, or more usually a combination of them, typical of this region. St George Church, a 15th-century Gothic edifice, marks the northern limit of town, on the edge of a 80m high cliff. Within the municipality of Limbourg-Dolhain, the village of Goé possess a well-known attraction for Belgians, the Gileppe Dam (Barrage de la Gileppe in French). Constructed between 1867 and 1875 and inaugurated by King Leopold II on 28 July 1878, the dam is 500 meter in length, 47 meter in height and 66 meter in depth at the base (15 meter at the top). Its capacity is of 13 million m³. The dam created the Gileppe Lake, originally covering 86 hectares, and extended to 130 hectares in 1971. The dam was designed to supply nearby Verviers with a regular flow of water for its wool industry, on which the city depended in the late 19th century. Nowadays the Gileppe Dam is equipped with a hydroelectric station producing 3,300,000 kWh annually. A 13.5m tall lion statue stands on top of the dam. It is the work of Félix Antoine Bouré (1831-1883). The statue is made of 183 stone blocks weighing a total of 130 tonnes. The lion faces East, guarding Belgium's eastern border. However, since 1920, with the annexation of the so-called East Cantons (Eupen-Malmedy-St. Vith), the border of Belgium shifted a dozen kilometres eastward. 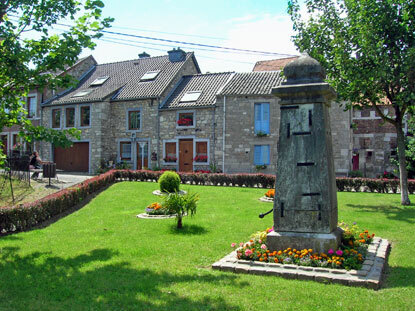 Limbourg is on the N61 road between Verviers and Eupen. 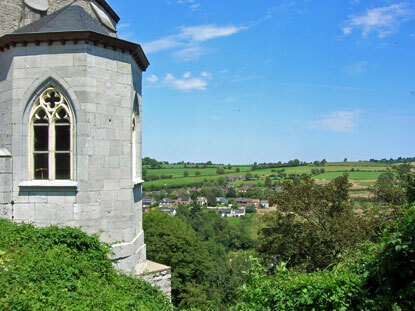 Coming on the E40 motorway, you can also take exit 37b and pass Bilstain to reach Limbourg. When you arrive in the village near the Vesdre River, follow the sign (left or right, depending where you are coming from) towards the old town. 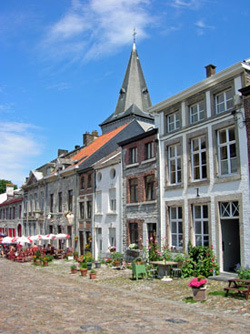 A narrow street goes uphill until a square in the centre of the old Limbourg. 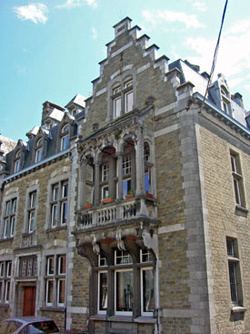 The nearest train station is Dolhain-Gileppe (12min from Verviers), from where you can walk to Limbourg (about 15min).